Wildfires cause devastating losses to livestock in Utah town | RANGEfire! 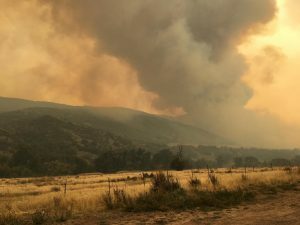 SPANISH FORK — Cattle ranchers in Spanish Fork suffered devastating losses to their livestock after the Pole Creek Fire swept through Sweat Creek Canyon. The fire killed more than 40 cows and calves — most of the animals died due to smoke inhalation while some burned where they stood. Rancher Eldon Neves said he’s moved his cows multiple times this summer to avoid fires. He thought they would be safe grazing in the narrows of the canyon just off of U.S. Highway 6. For the past several days Neves searched the canyon for the remaining livestock. Thirty cows are still missing. Neves described the scene as endless gray with the terrible smell of burnt flesh. “You can’t identify them by color because the ear tags are burned off, the ear marks are burned off,” he said. The Pole Creek fire burned up and over the mountain from the Payson area. Neves said he feels fire crews had opportunities to put the fire out before it got this far.